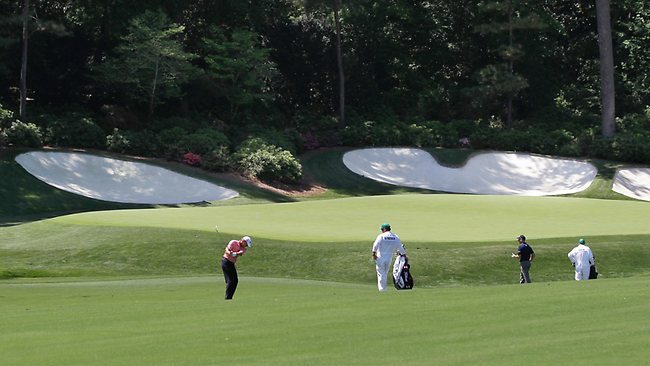 The greens at Augusta are always a point of huge debate. Every year we see great players looking foolish as they struggle with the lightening pace of the Augusta greens. Good putting is usually a key feature in the performance of the man standing with a green jacket on, come Sunday afternoon. When Tiger won in 2007 he didn’t have a single three putt the whole week. Last year Charl Schwartzel had an impressive average of 26.75 putts per round. At Augusta the pins are cut on slopes about 25% steeper than what they usually face on tour and although the gentlemen of Augusta never disclose the stimp of their greens it’s estimated that they run 20-30% faster than the tour average speed. So what does that mean for the players competing? It means the accuracy of all aspects of their games will be severely tested. Let me explain. The players must drive the ball into position to allow for the easiest approaches to the testing greens. A big feature of the Augusta greens is the roll offs surrounding the pin locations. In most cases the players have only a 10-15ft area to hit for their ball into otherwise theyl will end up rolling 40-50ft away leaving them looking very foolish indeed. So as you can imagine there will be a premium on accurate approach play this week. Once they get on the greens the real fun begins. Using the fundamental principles of AimPoint green reading we can simulate a lot of the challenges facing the players. Let’s start with short putts, the faster green speeds and steeper slopes mean that even putts of just 2ft in length must be aimed outside the hole to have any chance of going in. This takes great touch and nerves of steel. As the putts get longer they become incredibly speed sensitive. For example a 20ft putt that is hit just 1/10 of a foot per second (which is imperceptible to feel) too slow may miss the hole by up to 4 inches where as at normal tour green speeds it would catch the edge of the hole and go in. Faster green speeds and steeper slopes demand more precision as errors will be greatly magnified. Tiger has said in the past of putting well at Augusta ‘I think it’s a product of good ball-striking that you’re able to putt well, because you can hit the ball decent around here and catch the wrong sides of slopes, miss them by a yard and the next thing you know, you’re 40, 50, 60 feet away and it wasn’t that bad of a shot’. I am in total agreement with the four time champion, this week watch for someone with their ball under control and great speed control once they get on the greens. On greens of high speed or large slopes ALWAYS aim to leave your approach shots below the hole when possible.